Manchester United and Liverpool are reportedly considering a potential transfer battle for Roma midfielder Kevin Strootman this summer. The Netherlands international is also becoming a top target for Inter Milan, so United and Liverpool may have to move quickly if they want to snap him up, according to Tuttosport, as translated by Calciomercato. 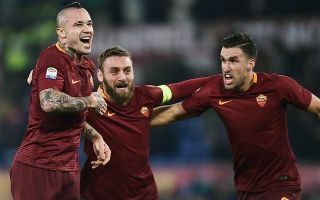 Strootman has shone during his time for Roma despite some injury troubles, and looks an easily affordable option for the two Premier League giants, who could do with improving their options in midfield next season. United are set to lose Michael Carrick as he nears retirement, while Marouane Fellaini is coming towards the end of his contract, leaving Jose Mourinho without much depth behind Nemanja Matic and the inconsistent Paul Pogba. Liverpool also face the departure of Emre Can on a free as he’s still to sign a new contract, while the likes of Alex Oxlade-Chamberlain and Adam Lallana have had injury problems as well. Strootman’s intelligence on the ball and ability to pick a pass means he’d be a great fit for either team, and Calciomercato noting that he has a release clause of just €45million should be good news for United and Liverpool.